This past March witnessed the debut of a new public musicology endeavor called the Critical Karaoke Radio Project. Founded at Colorado College by playwright and hip-hop professor Idris Goodwin, novelist and literary critic Steven Hayward, and myself, Ryan Bañagale, professor of American music, the project consists of an hour-long, monthly program called Critical Karaoke and daily, 90-second modules called A Day in the Life. These interrelated audio programs bridge the divide between scholarly and public audiences, introducing new perspectives and insights on both familiar and unknown encounters with music. We hope to use music to inspire a wide-ranging, highly engaging, and uniquely diverse discussion of key themes not only in musicological scholarship, but also in the humanities more broadly. To date we have recorded, produced, and released five episodes of Critical Karaoke and 115 A Day in the Life modules. All of our programming can be accessed on our website or Facebook page. Perhaps the easiest way to listen is via our iTunes podcast. Like most good ideas, ours was based on an existing one—though we have pushed the concept to the next level. Originating in the spring of 2004 at the Experience Music Project's annual Pop Conference in Seattle, “Critical Karaoke” was first intended as a response to the never-ending lists naming “The Greatest Songs of All Time.” The basic premise of “Critical Karaoke” is that you deliver a prepared discussion of a song that holds special significance to you for exactly its duration. No more, no less. That is, you hit “play” and start talking. You should talk continuously over the course of the song, timing out the delivery of your remarks to highlight specific aspects of the music and lyrics—that is where the “karaoke” aspect emerges. When the song is over you must stop. The goal of the Critical Karaoke Radio Project is to re-envision the practice of “Critical Karaoke” with the specific aim of broadcasting it via radio and podcasts—to render the auditory particularity of the form as richly as possible, while opening up space for further discussion and critique of the ideas inspired by the music itself. Our hour-long Critical Karaoke radio program is designed to feel like a casual, intellectually informed conversation. Each episode offers sustained interdisciplinary discussion of a selection of musical works oriented around a particular topic that trigger an exploration of a wide variety of humanities-related themes. For example, our episode on “Cover Songs” opens up into the ramifications of the politics of appropriation that arise when one artist performs another artist’s music. We delve into issues of racial representation, appropriation of voice, and the wide problematic of how history is captured and reinterpreted through the musical act. As a means of keeping our audience engaged between episodes of Critical Karaoke, we have created a series of daily modules called A Day in the Life—sort of like Pulse of the Planet or Writers Almanac, but quirkier, more engaging, with a better soundtrack and focused on music. Some of our more popular recet segments have focused on “Blackbird” by The Beatles, Kent State, Gustav Mahler, MTV Unplugged, and Back to the Future. We produce a new episode every weekday. Preparing my remarks for this episode, I located very little information on Dielman beyond his mention in a few books and other publications. Nor could I locate any recordings of his presidential compositions, which makes sense given their date of creation. 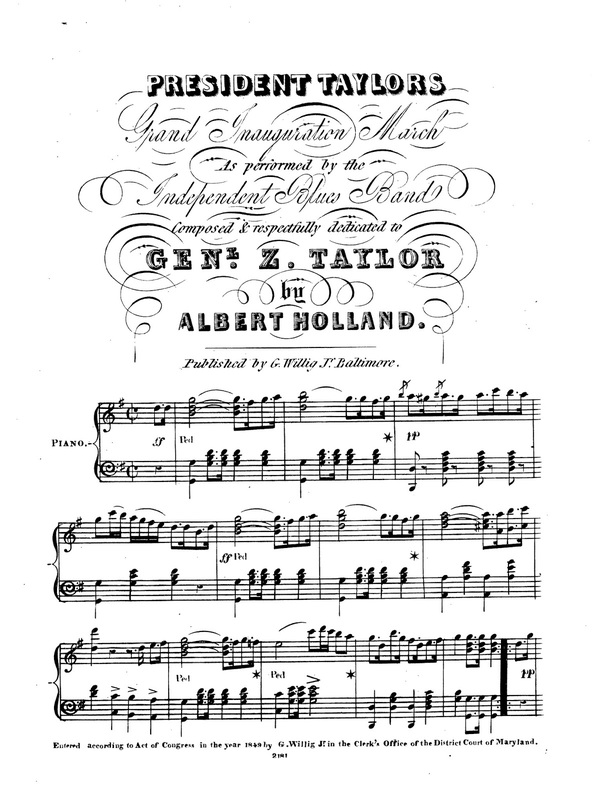 Faced with the question of how to provide audio for the episode, I turned to the Sheet Music Consortium, which preserves piano-reductions of his more popular works. 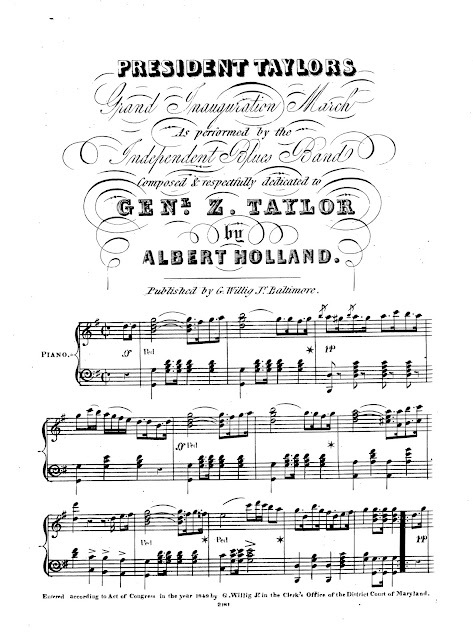 I recorded a few of these to sound “old-timey,” including a version of “President Taylor’s Grand Inauguration March.” However, I realized after the episode had been released that the version cataloged by the Library of Congress Performing Arts Encyclopedia was NOT actually by Dielman: although the cover page bears his name, the subsequent score is by Albert Holland. I have alerted the authorities on this error. 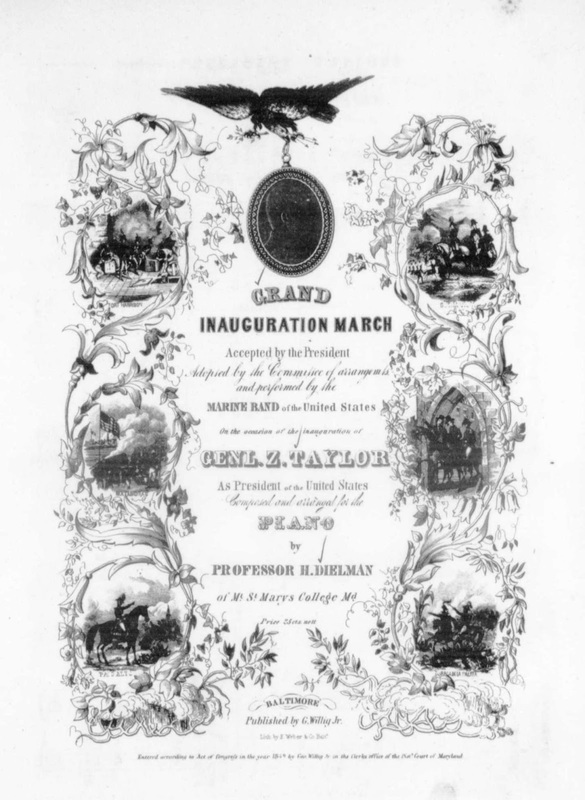 Now I just need to go back and edit in the correct “Grand Inauguration March” into the podcast—which is possible when dealing with digital media! This episode accomplishes three musicological tasks: it brings attention to Dielman’s existence, it makes his music audible, and it uncovers an error within a publicly available archive. These are admittedly small errands—but not too shabby for ninety seconds of airtime. As the Critical Karaoke Radio Project develops, we actively seek wider distribution. Both A Day in the Life and Critical Karaoke can be made available for free to any public radio station. As mentioned above, the podcast is available for free as well. Perhaps more importantly, we are looking for others who are interested in being part of this innovative, not-very-labor-intensive-but-still-very-cool-project. Matthew Mugmon (University of Arizona) has been contributing regularly to our A Day in the Life episodes, including the Mahler segment mentioned above. Other musicologists who have committed to contributing to the Critical Karaoke Radio Project at this time include Vilde Aaslid (Columbia University), Hannah Lewis (University of Texas at Austin), and Travis Stimeling (West Virginia University). Would you like to be involved too? Please comment below, send me a quick email, or ping us on Twitter to me with subject suggestions for individual days or ideas authoring an individual A Day in the Life episode yourself—there is no shortage of days and we are happy to showcase your expertise! Ryan Bañagale is Assistant Professor of Music at Colorado College. He is author of Arranging Gershwin: Rhapsody in Blue and the Creation of an American Icon (Oxford UP, 2014) and was both an AMS-50 and an AMS-75 PAYS recipient. HIP, HIP . . .